The Traditional Edition wood pet urn offers a simple yet dignified resting place for your companion. These handsome pet memorials are available in three American hardwoods making them well suited for placement in any room of your home or office. 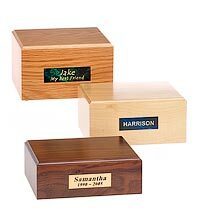 Choose a Maple, Red Oak or Walnut pet cremation urn, whichever you feel will complement your personal style and decor. Each includes a nameplate that completes your pet memorial to your trusted friend. Our wooden pet urns are available in four sizes for pets up to 120 lbs. 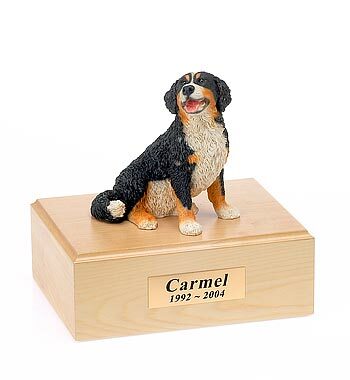 Traditional Edition pet urns are personalized with a solid brass nameplate including an inscription of your choosing. The inscription may be one, two or three lines. We provide a choice of nameplate colors to compliment your wood pet urn. Select from Gold Bright Brass, Blue Marbleized, Brown Marbleized or Green Marbleized. For actual nameplate colors and inscription styles see the nameplates here. Your pet's bagged cremains are placed in the pet urn via a removable bottom panel, secured by four screws. This bottom panel is covered in black felt and has four rubber feet to protect the surface where your cat or dog urns are placed. Please refer to our FAQ page for directions on how to place your pet's cremains in Traditional Edition pet urns. I received Tom's memorial urn today and it's absolutely lovely. We have already put his ashes in it and put it in a place where we will always see him and remember how he was such a wonderful cat. Thank you so much Mark, and the rest of the Angel Ashes staff. Barney's urn arrived on time and without damage. I am impressed by your business, and will provide referrals when asked.